Sophomore Fair: Monday, Sept. 10, 2018 | 10 a.m.-2 p.m.
Sophomore Celebration: Tuesday, Sept. 11, 2018 | 5:30-7:30 p.m.
As you begin your sophomore year, celebrate with us at the Sophomore Fair and Celebration. 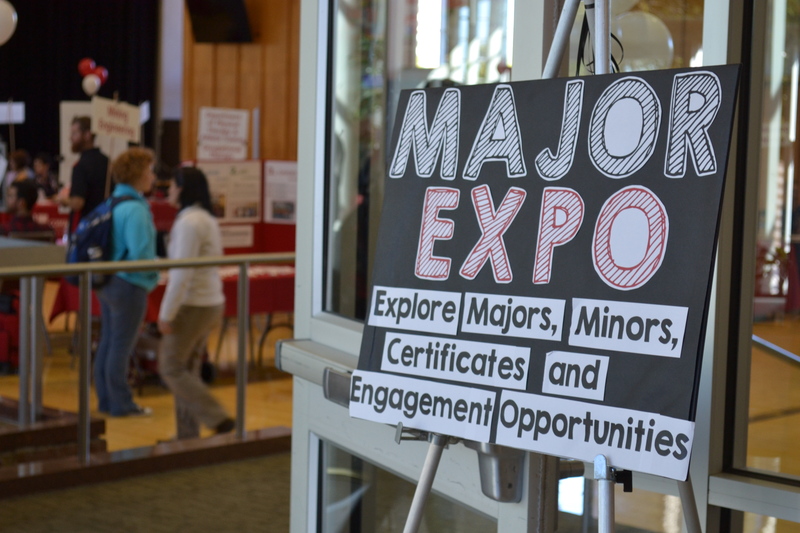 The Sophomore Fair is for any student in their second year. There will be games, food, entertainment and many other fun and engaging activities. Dress to impress for the Sophomore Celebration. RSVP today before it closes. We hope you will join us. We want to ensure there are plenty of tools and resources at our students’ disposal to help them rock their second year at the U. We are here for you—take advantage of all we have to offer to stay on track to achieve their goals. 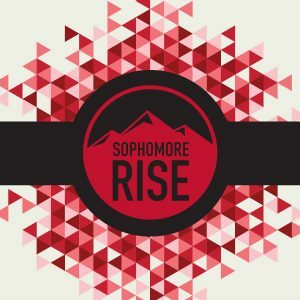 To learn more about Sophomore Rise, click here. 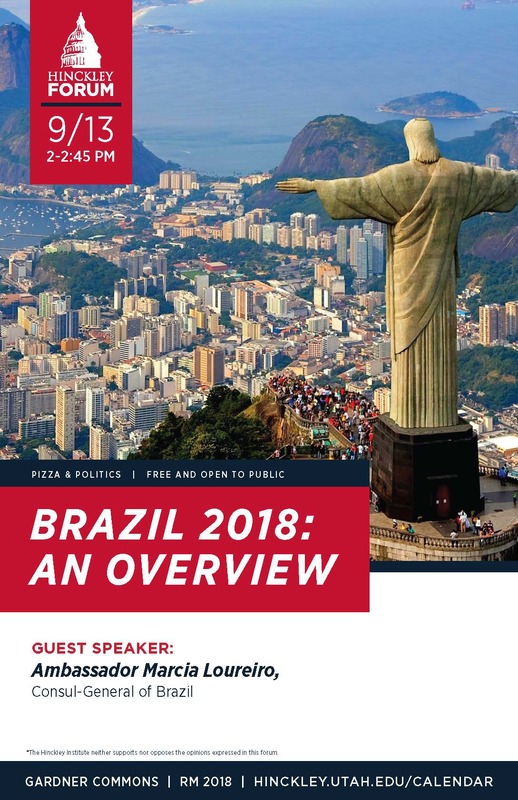 PIZZA & POLITICS | WHAT IS HAPPENING TO THE AMERICAN DREAM? Monday, Sept. 10, 2018 | 12-1:30 p.m.
American Dream Dialogue Series: In our first of a three-part dialogue series, panelists will discuss what is happening to the American Dream. 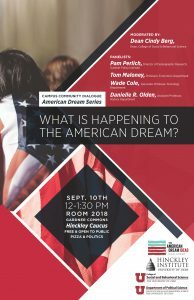 What do we mean when we talk about the American Dream? What are the key factors contributing to the shrinking middle class in America today? How does attainment of the American Dream vary demographically? 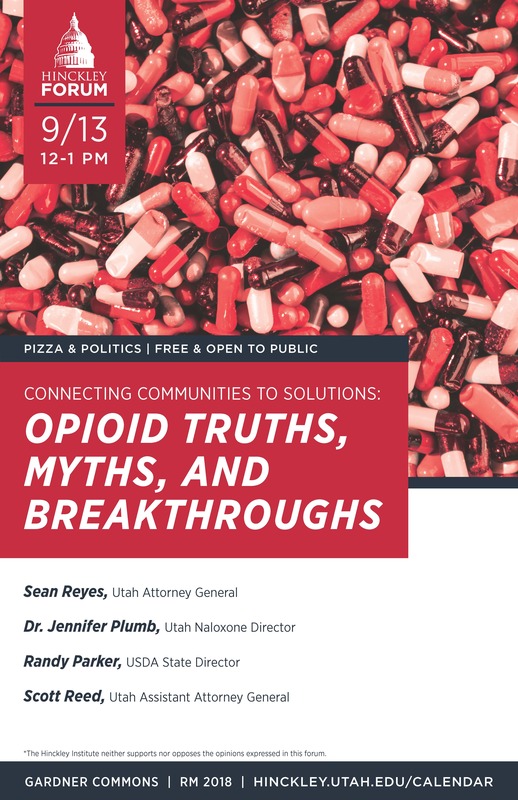 Cosponsored by the Department of Political science, the College of Social and Behavioral Science and The American Dream Ideas Challenge at the University of Utah. 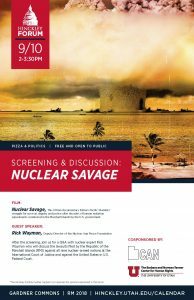 Monday, Sept. 10, 2018 | 2-3:30 p.m.
“Nuclear Savage” follows Pacific Islanders’ struggle for survival, dignity and justice after decades of human radiation experiments conducted in the Marshall Islands by the U.S. government. 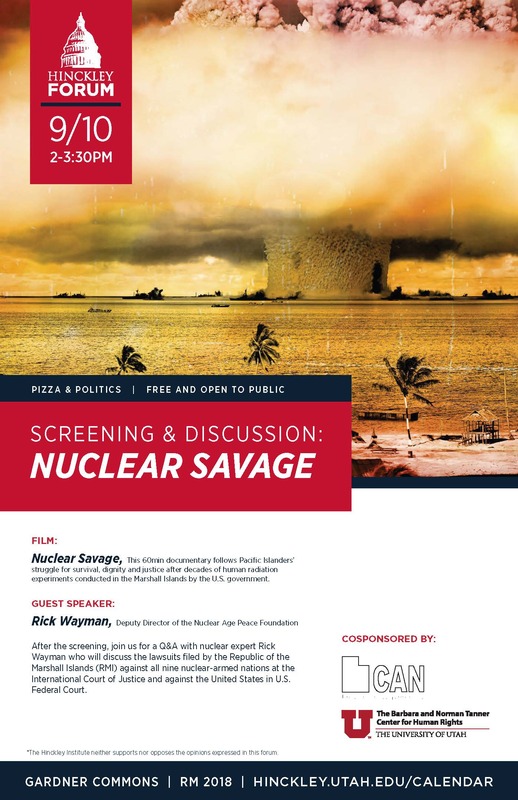 After the screening, join us for a Q&A with nuclear expert Rick Wayman, deputy director of the Nuclear Age Peace Foundation. Wayman will discuss the lawsuits filed in 2014 by the Republic of the Marshall Islands (RMI) against all nine nuclear-armed nations at the International Court of Justice and against the United States in U.S. Federal Court. Wayman’s organization, the Nuclear Age Peace Foundation, consulted the RMI in these cases. Wayman spent two weeks in the Hague in 2016 supporting the RMI’s legal team during the oral arguments at the International Court of Justice. Cosponsored by the Barbara and Norman Tanner Center for Human Rights and the Utah Campaign to Abolish Nuclear Weapons. Meet & Greet reception at 5:30 p.m. | Lecture at 7 p.m.
Use promo code: “student” at checkout. PIZZA & POLITICS | WHAT IS THE FUTURE OF THE IRAN NUCLEAR DEAL? 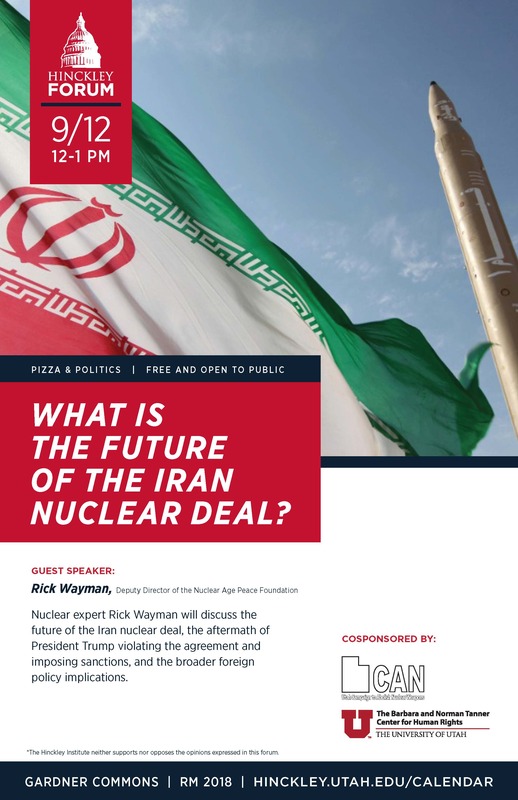 Wednesday, Sept. 12, 2018 | 12-1 p.m.
Nuclear expert Rick Wayman, deputy director of the Nuclear Age Peace Foundation, will discuss the future of the Iran nuclear deal, the aftermath of President Trump imposing sanctions, and the broader foreign policy implications. Indoor Ice Climbing? YES! Ice isn’t available all the time and it isn’t always easily accessible. This clinic will give you a taste of what ice climbing is all about, but on our indoor climbing wall and without the freezing temps. Learn about technique, style, movement and efficiency with the use of your climbing shoes and mock ice tools to ascend the wall. 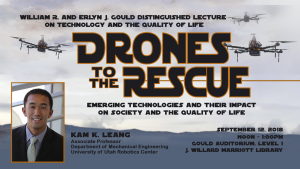 Sept. 12, 2018 | 12 p.m.
“Drones to the Rescue: Emerging Technologies and Their Impact on Society and the Quality of Life,” Kam K. Leang, associate professor of mechanical engineering. Over the last decade, drone technology has advanced significantly, due in part to innovations in small mobile devices including cellphones, tablets and other personal electronics. Kam K. Leang received his bachelor’s and master’s degrees in mechanical engineering from the University of Utah, and a doctorate from the University of Washington. Leang is an associate professor in the Department of Mechanical Engineering at the University of Utah. 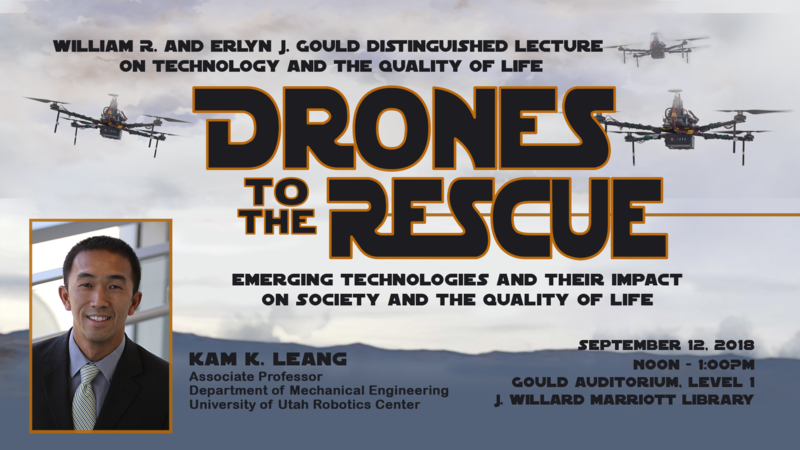 He is also affiliated with the University of Utah Robotics Center. Learn more here. Sept. 11, 13, 25, 27, 2018 | 5:30-9:30 p.m. 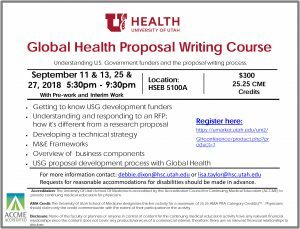 Global Health has developed a proposal writing course with the goal of increasing faculty and staff’s knowledge and skills in developing winning proposals for large U.S. government agencies and growing the University of Utah’s portfolio of Global Health programs. The emphasis is on programs rather than research. This is a four-day course, 5:30-9:30 p.m. Sept. 11, 13, 25 and 27, 2018 (Tuesdays and Thursdays), HSEB 5100A. It involves some pre-work (reading and online module) and interim group work and offers 25.25 CME credits. Questions? 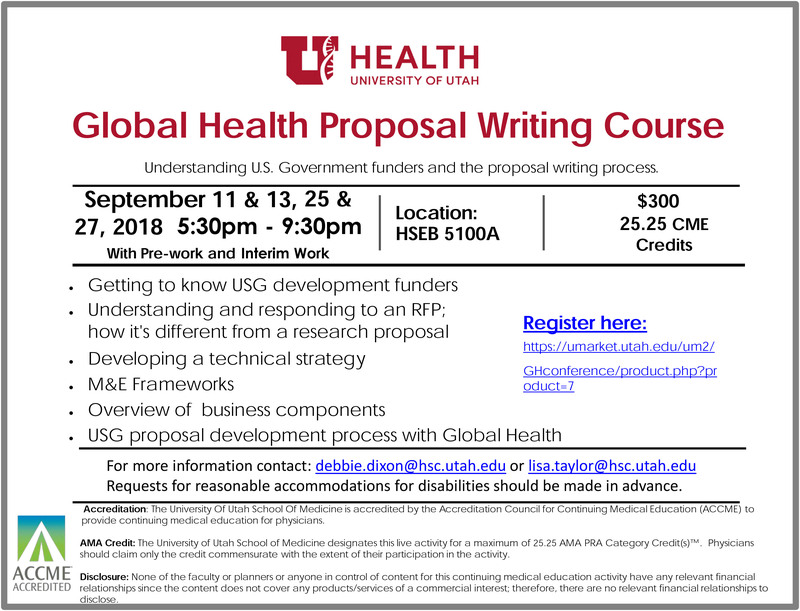 Contact debbie.dixon@hsc.utah.edu or lisa.taylor@hsc.utah.edu. Wednesday, Sept. 12, 2018 | 8:30 a.m.-3 p.m. 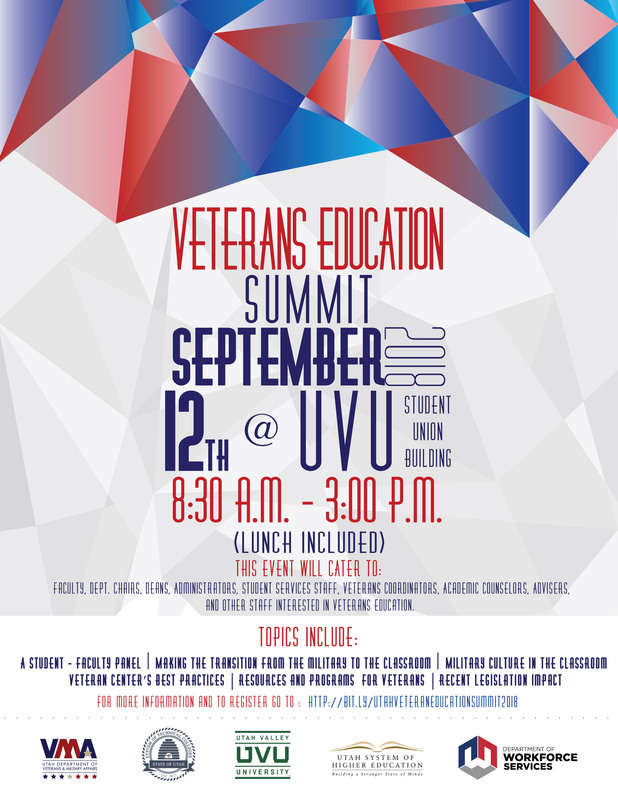 This event will cater to faculty, department chairs, deans, administrators, student services staff, veterans coordinators, academic counselors, advisors and other staff interested in veterans education. Topics: A student-faculty panel on making the transition from the military to the classroom; military culture in the classroom; the veteran center’s best practices resources and programs for veterans recent legislation impact. For more information and to register, go here. Thursday, Sept. 13, 2018 | 12-1 p.m.
Thursday, Sept. 13, 2018 | 2-2:45 p.m. Ambassador Marcia Loureiro, Consul-General of Brazil. will speak. Join us as we backpack through time in the Bears Ears. This adventure will be amazing but a bit on the strenuous side as we will be carrying heavy packs. Trip includes leadership, transportation, most meals and equipment. 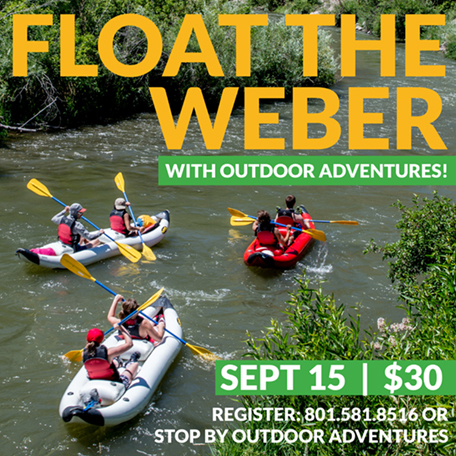 Call 801-581-8516 or stop by Outdoor Adventures to register today. Drop in to the Eccles Student Life Center and Experience the latest in aquatics obstacle course fun. The WIBIT will be set up and available FREE during specific times from Sept. 14-16. Check out campusrec.utah.edu for a complete schedule. Bring your friends, run the course, and have a great time. Let’s go paddle the Weber River. We will paddle inflatable kayaks along this class 2 stretch of river. Participants must be able to swim and feel comfortable in moving water. Come prepared to get wet. Bring sunscreen, sunglasses, hat, and a water bottle, along with a change of clothes for the drive home. Trip includes leadership, transportation, equipment and a snack. 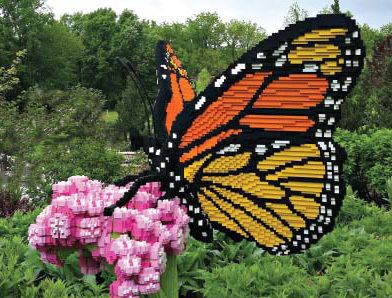 Inspired by nature and built with more than 450,000 LEGO® brick pieces, the popular Nature Connects exhibition features 14 larger-than-life displays placed throughout the Garden. Sculptures by artist Sean Kenney. Regular garden admission required and garden members are free. Wednesday, Sept. 19, 2018 | 10 a.m.-2 p.m. 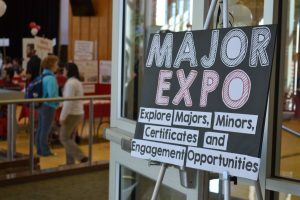 The 2018 Major Expo is the biggest and best place to explore majors, minors, and certificate programs all in one place! It’s free, it’s casual, it’s informative and fun. 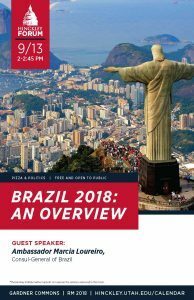 All students are welcome to see what the University of Utah has to offer since there’s something for everyone whether you are looking for a major, already declared but interested in minors or seeking experiences beyond the classroom like internships, learning abroad and research. How Does It Work: Advisors, faculty, and student representatives from over 100 academic departments will host walk-up tables in an informal meet and greet setting. Why Should You Attend: No appointments needed! Speak to advisors and experts from every academic program in one convenient location. Also score some free swag, popcorn, and goodies. Wednesday, Sept. 19, 2018 | 12-3 p.m.
Join us in informing, connecting and discovering at the Eccles Health Sciences Library Open House, hosted during President Ruth Watkin’s inauguration week. We’ll be showcasing technologies and resources available to students, staff, faculty and community members. 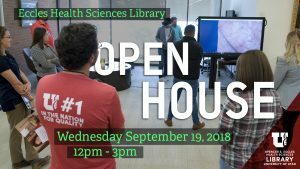 World premiere of Eccles Health Sciences Library introduction video. New virtual reality spaces and equipment. THE Studio: A comprehensive space with new features used to create multimedia educational videos, podcasts and other learning tools with high-quality camera and equipment. Anatomage Table: Visualize and interact with a highly accurate human anatomy in digital 3-D with an update that includes improved user interaction and an added human body. 3-D Printer: The Gary L. Crocker Innovation & Design Lab offers fabrication equipment and tools to aid innovators in the creation of medical devices and prototypes. 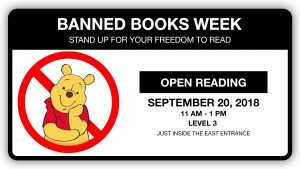 Thursday, Sept. 20, 2018 | 11 a.m.-1 p.m.
Make your voice heard and fight for your right to read! 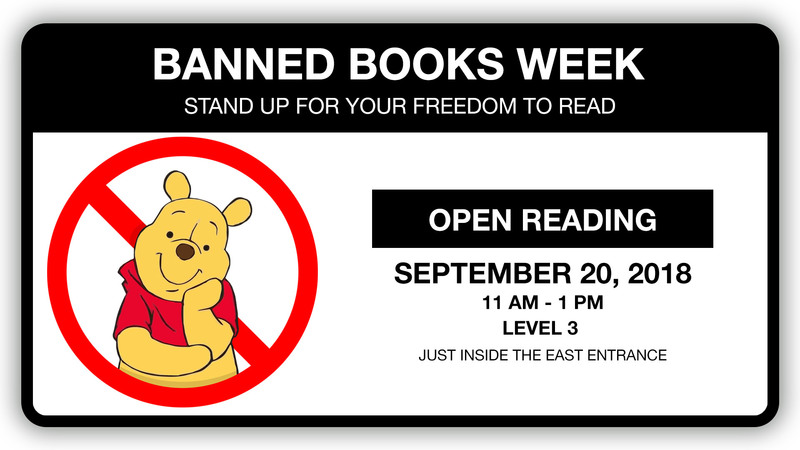 Read aloud from your favorite banned or challenged book. Bring your own or feel free to choose from selections we’ll bring to the event. Free refreshments will be provided. Come “tri” something new with Campus Rec. Are you a superb swimmer? A brawny biker? A rad runner? None of the above? Then come try out something new with the Campus Rec Sprint Triathlon. This sprint triathlon is a great event for everyone, whether you’re a veteran triathlete or you’ve never tried one before. There are great prizes for the overall winners in each division and all participants get an awesome T-shirt. Early bird registration ends on Sept. 14 and space is limited so sign up soon. Monday, Oct. 1, 2018 | 3 p.m. The next Academic Senate meeting will be Monday, Oct. 1, at 3 p.m. in the Moot Courtroom of the College of Law. Senate meetings are open to the public. The agenda will be posted online approximately one week before the meeting. Approved a Senate task force to review student input in the RPT process. Approved a Senate task force to consider a career-line faculty parental leave benefit. Discussed a new parental leave benefit for some categories of staff (to be voted on Oct. 1, 2018). New Senior Vice Presidents Daniel Reed and Michael Good were also introduced to the Senate and shared brief comments. Friday, Oct. 5, 2018 | 9 a.m.-2:30 p.m. 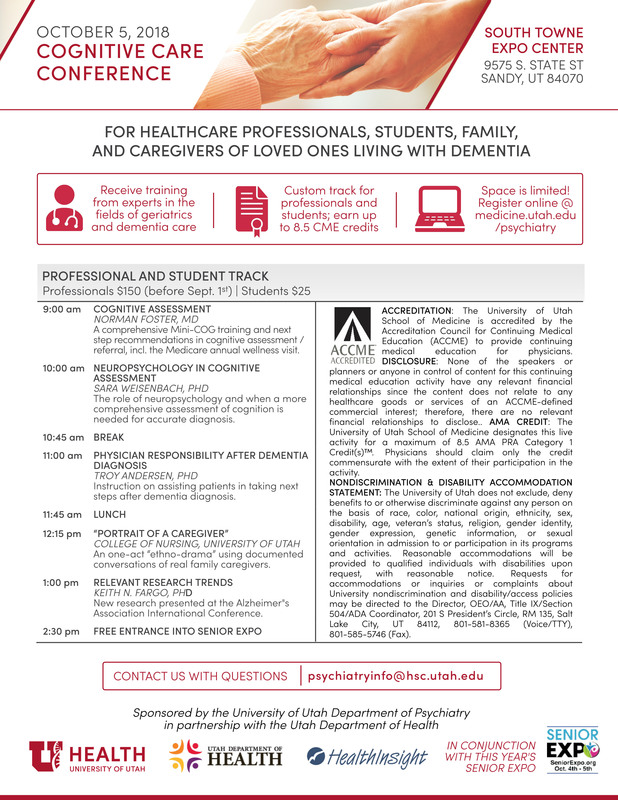 The Department of Psychiatry, College of Nursing and Department of Neurology in partnership with the Utah Department of Health is presenting a Cognitive Care Conference on Oct. 5. 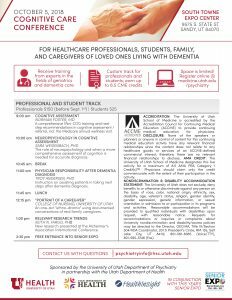 It is for both health care professionals, students and caregivers of loved ones living with dementia. CME’s and CEU’s are offered for professionals. 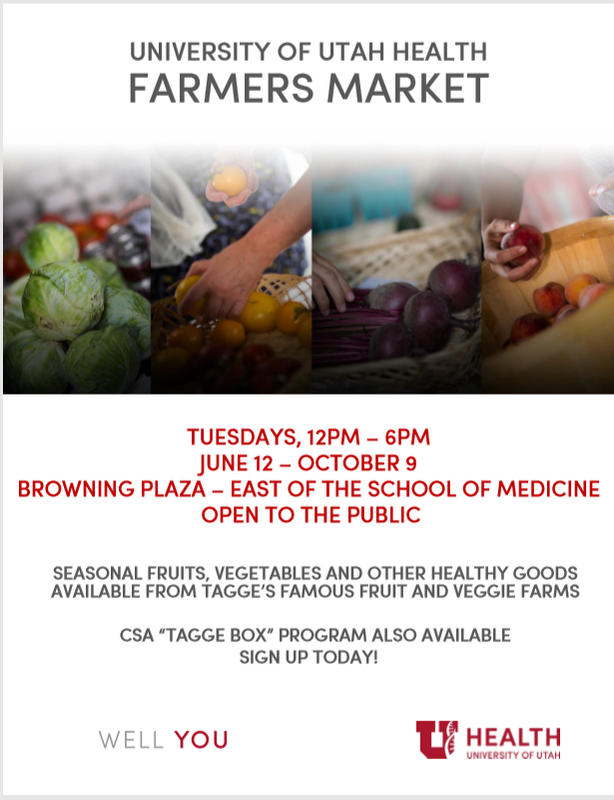 Tuesdays, through Oct. 9, 2018 |12-5 p.m.
Wellness and Integrative Health is presenting a weekly Farmers Market every Tuesday from 12-5 p.m. in Browning Plaza located east of the School of Medicine starting June 12-Oct. 9, 2018. 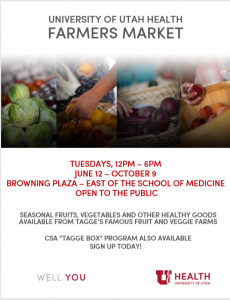 Seasonal fruits, vegetables and other healthy goods available from Tagge’s Famous Fruit and Veggie Farms. Learn more about Tagge’s Famous Fruit and Veggie Farms here. Free Week may be over but we’re just getting started! Get motivated and stay motivated in one of our group fitness classes. Classes started this week but registration is ongoing. View the complete schedule at campusrec.utah.edu and register today. Registration is now open for all climbing classes and clinics at The Summit. Did you know that over 4 billion people can’t swim? Don’t be one of them. Swimming is not only fun, but potentially life-saving. The Student Life Center has a variety of swim lessons and classes for beginners to advanced swimmers. 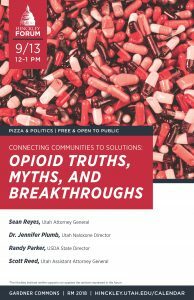 Check out the full schedule at campusrec.utah.edu and register today.